A grizzly bear looks around after napping for hours along the Yellowstone River in the Hayden Valley of Yellowstone National Park. Captured with a Canon 7D and 500/4.0L IS + 1.4TC III in aperture priority mode with an exposure bias of 0 at ISO200, f/7.1, and 1/400th of a second. The camera was mounted on a Gitzo 3540XLS and Induro GHB2 gimbal head. Way back in September I took some students from my ART247 Nature Photography course to Yellowstone for the weekend. We left Billings at 5am and raced over the Beartooth Pass in time to shoot sunrise, it was a crisp morning. The morning chill was fleeting and as we made our way into the park you could have told us it was July with the warm temperatures and crowds. 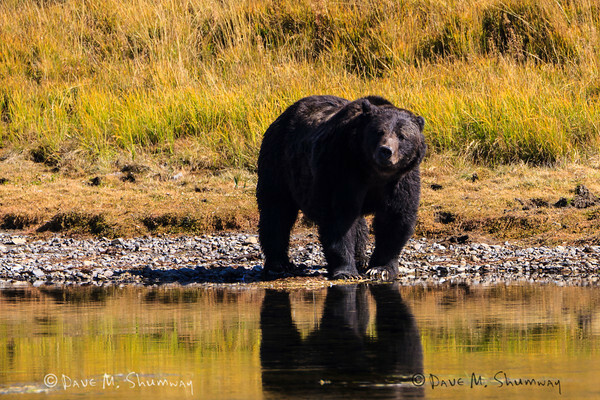 We made our way over Dunraven Pass and into Hayden Valley where we spent a few hours with the darkest grizzly bear I have seen in ages. From there we had an uneventful drive South along the Lake and up to Old Fateful, where I got to play tourist. After watching the eruption from the parking lot we decided to have lunch, go for a walk and wait for a second eruption. We made our way North towards Norris to watch the Cygnet Fire as it flared up in the hot and dry conditions. Sunset was spent in Mammoth with a bull elk and then photographing the incredibly dry Upper Terraces (dryer than I have ever seen them). Pizza at our favorite spot...K-BAR, and then off to the Super 8 for a great nights sleep. Up early and South towards Maddison, but we got distracted by the sun rising through thick smoke from the fire. The Valley was warm and relatively void of elk, so we made our way to Firehole drive to try our hand with photographing the falls before the sunlight got into the Canyon. From there we made our way to Great Fountain Geyser just in time for an eruption. After that we made an uneventful trip back out of the park towards the Beartooth Pass, we only stopped to shoot some of the falling leaves. As we made our way up the Pass snow started to fill the sky, and atop the Pass we found an opening in the storm and made some landscapes of the fall foliage, snow and grand vistas from the "top of the world." The students had a great time, and I take the rest of my students to the park this weekend, but the weather promises to be much cooler this weekend.